to uncover a black servant who was painted out." [Full story]. Got me wondering, whatever happened to Shawfield Mansion (built 1712) below? Where exactly did it stand and when was it pulled down? John Glassford literally had his picture turned to the wall. The Victorians never reproduced his portraits, and an attempt a few years ago to obtain any kind of likeness of John Glassford was about to fail when an early portrait was found. His wrongdoing was that of dying in financial difficulties. He was worth no more than eight shillings in the pound, and his family, in the endeavors to effect an improvement, made things so much worse that his affairs were in part never cleared up. The merchants began to acquire ground, between High Street and what is now Union Street, for their town mansions and gardens. When Glasgow spread west along Argyle Street, new streets had to be built through these gardens, and the merchants-or their heirs-came out of the sale of their property extremely well. Many of the streets bear the names of these men of the eighteenth century, and while some, for instance, Cochran Street and Ingram Street, were so called because of the high regard in which the men were held, others, such as Glassford Street, were named simply after the owners of the grounds through which they were laid out. I think the building was at the junction of the now Glassford Street and Trongate probably over the road facing Stockwell Street. The house was demolished in 1792. You can see a reproduction of the painting in the People's Palace. JohnR wrote: I think the building was at the junction of the now Glassford Street and Trongate probably over the road facing Stockwell Street. 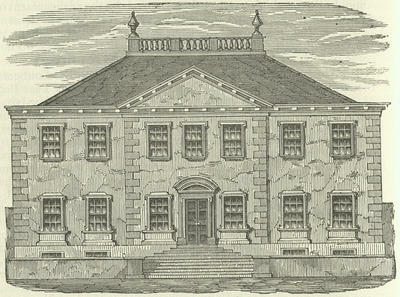 The house was demolished in 1792. John, thanks for this. The Oakley passage makes interesting reading. It's unfortunate I can't find any maps produced while the mansion was still standing. Yes. I found an interesting article which gives details of the building dimensions. I don't think I've ever heard anything about slaves in Glasgow though I don't doubt there were some around. Just shows how you can fiddle with history if you have the mind to. The People's Palace also has a silver, slave's collar on display. Last edited by John on Mon Mar 19, 2007 5:34 pm, edited 1 time in total. Thanks for posting that link Onny. Very interesting. Sad to say that I've met quite a few Jamaicans here in London, who have Scottish Surnames. 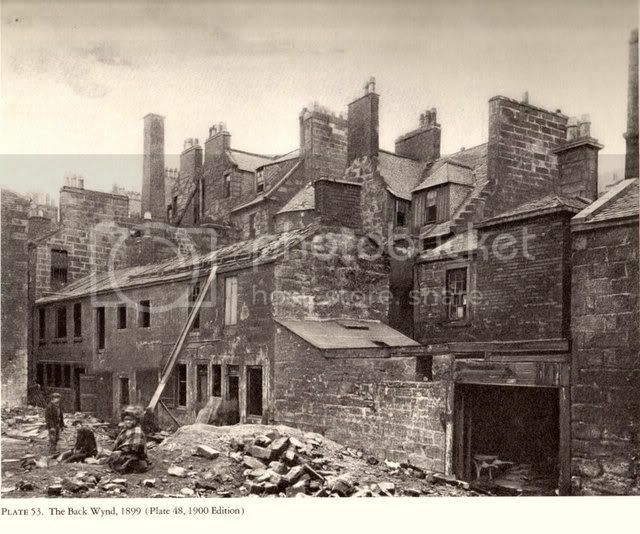 This one has always intrigued me, it's taken from"Old Closes & Streets of Glasgow 1868 / 1877" by Thomas Annan. Who was this young black girl? Where did she come from? Where did she go? The Shawfield mansion was built in 1712 for Daniel Campbell of Shawfield who later went on to become an MP for the city and voted for the hated Malt Tax in Parliament, sparking a riot in the city and the sacking of the mansion (summer of 1725, was a good yin wint it HH ). Campbell was later awarded compensation to the tune of £10,000 by Parliament - a hefty slice of Glasgows annual budget! - but never quite felt at ease in the city again and sold the Shawfield Mansion the following year. The Mansion was bouhgt by John Glassford in 1760, who lived there until his death in 1783, the house remaining in the hands of the Glassfords until his son sold it to the builder William Horn in 1792 who demolished the house and orchard garden and laid Glassford St through the fue. The House itself sat at the mouth of Glassford St and was designed by the great London architect and author of that seminal architectural guide, the Vitruvius Britannicus, Colen Campbell, and was his first recorded work and one of the earliest examples of a Palladian Villa in Britain! The image in the first post doesn't quite show all the detail of the Mansion as it was known to have iron railings surrounding it, rows of fine chimneys on the roof and more mouldings... even a pair of sphinxes guarding the door which I think found thier way to Scotstoun House after it was demolished. Scotstoun House being long-gone too. crusty_bint wrote: The image in the first post doesn't quite show all the detail of the Mansion as it was known to have iron railings surrounding it, rows of fine chimneys on the roof and more mouldings... even a pair of sphinxes guarding the door which I think found thier way to Scotstoun House after it was demolished. Scotstoun House being long-gone too. eltor2ga wrote: I don't think I've ever heard anything about slaves in Glasgow though I don't doubt there were some around. Just shows how you can fiddle with history if you have the mind to. 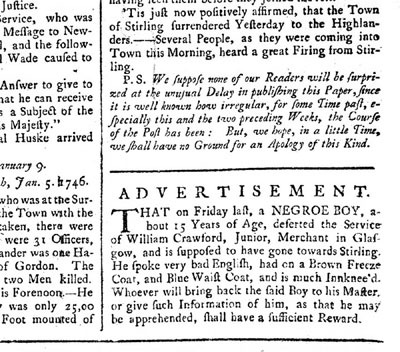 This advertisement from the Glasgow Journal of 30 December 1745 offered a reward for the return of the boy to his master, or for information which might lead to his capture. The boy was only 15 years old and probably did not get far. He was alone in the middle of winter in a country he did not know, speaking very little of the language. There were few if any other knock-kneed black people living in Scotland in the 1740s. The advertisement does not use the word slave, but some Glasgow merchants brought slaves back to Scotland from the Americas to act as servants. The legal position of such servants was unclear until the 1770s when the Court of Session ruled that black servants brought to Scotland did not owe "perpetual service" to their masters - a ruling which effectively established the illegality of slavery in Scotland. I wonder what happened to the boy. love with Clementiana Walkinshaw. They later married in France. Street which continued the axis of Stockwell Street. Apparently the mansion was the home of the City of Glasgow Bank, the Post Office (1840-57) and the Trades House. 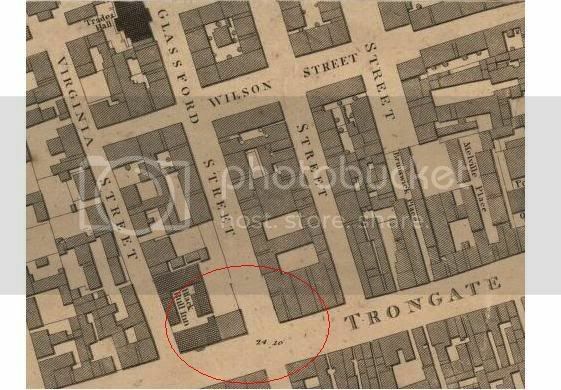 I had no idea that Trongate was known as St. Thenaw's Gate in 1454, when the Tolbooth was mentioned as being beside the Cross, at the corner of St. Thenaw's Gait and High Street. Fascinating stuff.